Mechanical music and fairground art are tightly woven together by their festive natures and the fact that they have been utilized by fair organizers since the late 19th century. The celebration is organized around three senses: sight, sound, taste. Childhood memories - marshmallows, gingerbread, cotton candy, wooden horses on carousels, monkey organs. Until the 1940’s many artists contributed to this art form called fairground art. Seductive baroque sculptures, scrolling, curves, animal sculptures, myths, all types of paintings… They all formed this popular art form often of excellent quality. Due to the fact that this art form was part of daily life it became obsolete with the arrival of modern trades in the 1940’s. Fortunately, for the last few decades, this art form has been rediscovered by a handful of collectors and has found its rightful place in the public eye and in the art world. The restoration of a piece of fairground art requires the involvement of a professional. The undercoating and pigments utilized at the time should be respected in order to accurately reproduce the results of the past. 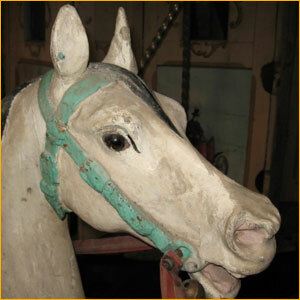 To find, restore and present fairground art to its highest degree is rare. We will attempt to satisfy your expectations.